I have many git projects in different folders. Is it possible to show list of names for all git projects in one buffer? One existing approach is: https://magit.vc/manual/magit/Repository-List.html#Repository-List. After setting magit-repository-directories, you can use M-x magit-list-repositories to display these repositories. 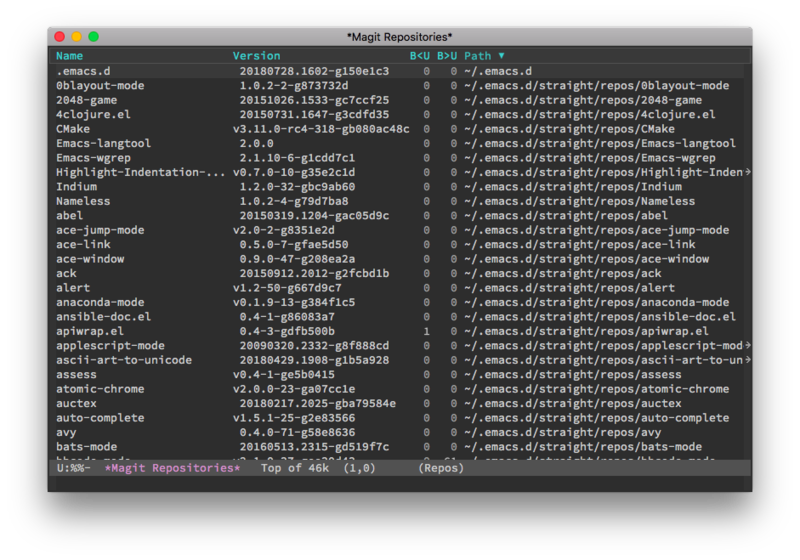 Here is a screenshot of M-x magit-list-repositories. One option would be via projectile. Git repos are considered projects by default. Doing M-x projectile-switch-project or C-c p p lists all git repos. This may not be the solution you're after and there is probably a better way but it works well for me if I haven't added a directory to my bookmarks. Not the answer you're looking for? Browse other questions tagged magit helm git .